Residents of Jerusalem’s Isawiya neighborhood and their supporters express frustration at increasing unrest and police presence. “Don’t tell us how to do our job. 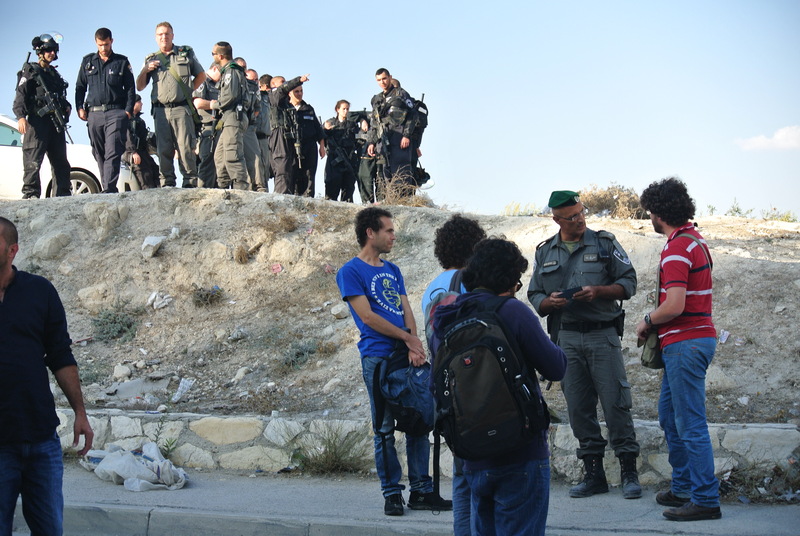 After all the stones we’ve received from the residents, we know what to do,” the bulky policeman explained to Muhammad Abu al-Hummus, a resident of Isawiya. The large and imposing Hummus, who walks with a cane, had gathered with a half dozen Jewish Israelis at the French Hill entrance to his neighborhood, a large suburb of Jerusalem that has become one of many flash points in the recent violence in the capital. Hummus and the Jewish activists, students at the Hebrew University of Jerusalem, had come to protest the blocking off of the main road to the suburb, which has an estimated 12,000 residents. A large row of concrete blocks had been placed across the road, as well as two fences to interdict traffic and people. “There are maybe 20 kids that are throwing stones, many come from outside, and we’ve had 400 injured,” Hummus told the police commander. Yoni Balaban, a law student at the university, said he had come because the neighborhood had been closed off. 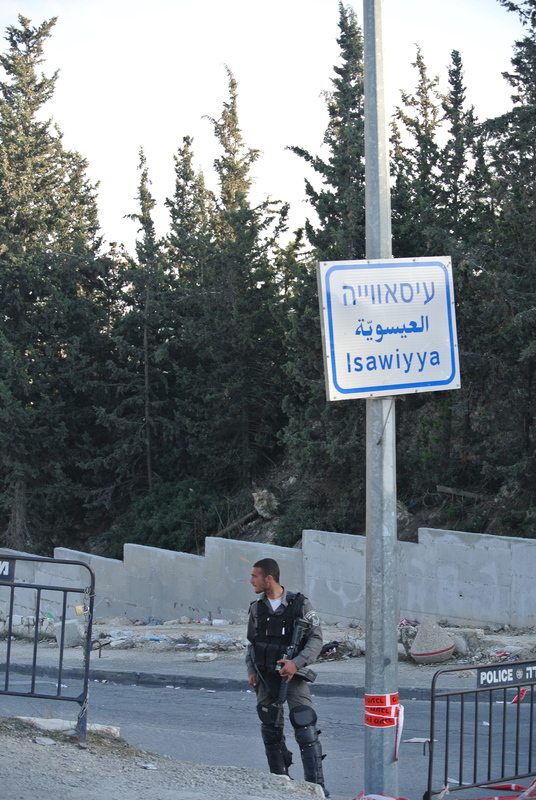 “Isawiya has been blockaded because of the demonstrations, but all of the neighborhood is being punished. We were invited by the neighborhood [leader] to see the entrance.” He felt the residents face a hard life because of the restrictions, he said. As we were talking, the police were collecting IDs from the Jewish activists and eventually asked everyone to move away from the entrance to the neighborhood. At the gas station overlooking Isawiya, more men had gathered to see the afternoon’s action. They watched as a line of 15 policemen, armed with tear gas and M-16s, walked into the neighborhood. “Police make many problems. They close off the village to make it hard for sick and elderly people. Yes, the kids throw stones, and for them it is like a game, like Tom and Jerry,” said one of the Arab owners of the gas station, who preferred not to give his name, and who lives near the Old City. His own gas station had been a victim of some of the rioters from Isawiya, but he was under every impression that the neighborhood residents are the victims. His son Khalil, who did not give his last name, was more passionate. “The Israelis are the occupiers; look at the police, each one is from another country, one from Ethiopia, another from Nigeria maybe,” he said. They both agreed that one of the main frustrations of residents was the lack of infrastructure and investment in the area. 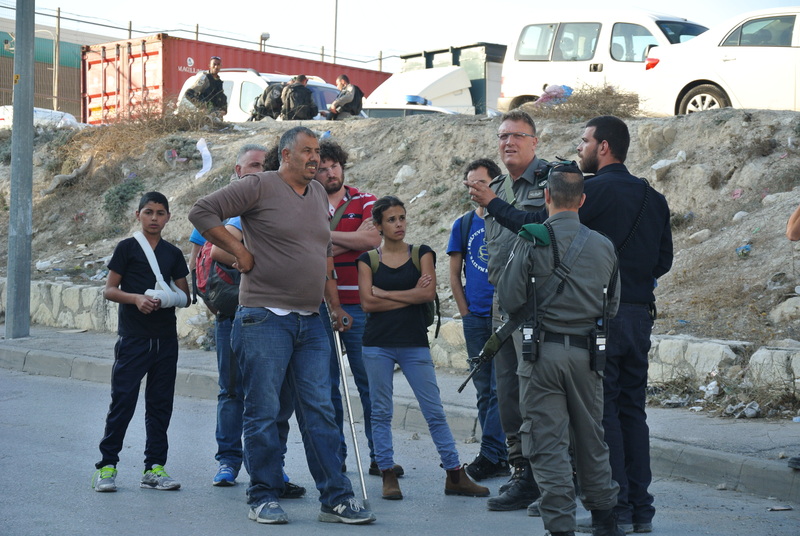 “Look at the roads, compare them to Beit Hanina [an Arab neighborhood in northern Jerusalem], they have no land to expand, this is the cause of the violence,” Khalil said of the destitute neighborhood. They argued there were no playgrounds and the schools were derelict. “The police treat them like the [Israeli army did the residents] in Lebanon,” Khalil said. But he was hopeful: “Everyone wants peace, no one wants to suffer.” At the western end of the neighborhood, below the stunning Hebrew University campus and Hadassah University Medical Center, concrete slabs had also been placed to interdict traffic. 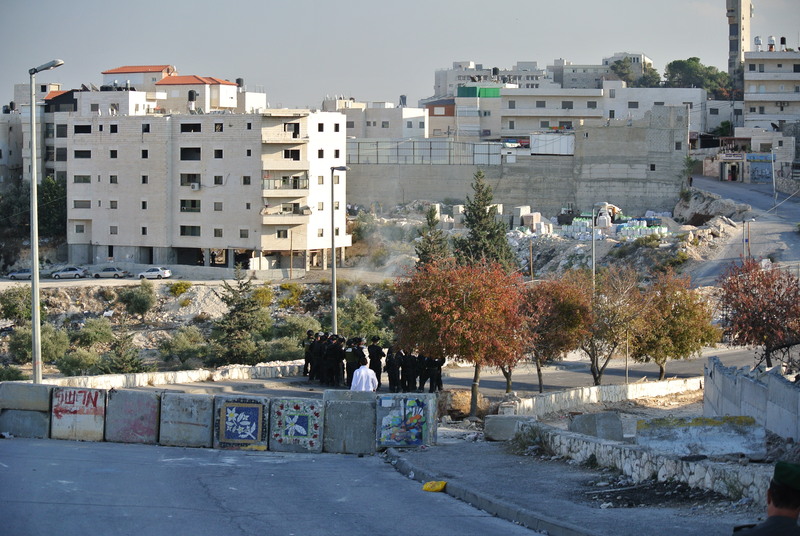 Dozens of Border Police and Jerusalem police were standing, surveying the neighborhood. As the sun began to dip below the horizon, the sounds of tear gas being fired could be heard. Large contingents of police were patrolling the streets, making their presence known. And following them were some young men and boys, throwing rocks when they had an opportunity. 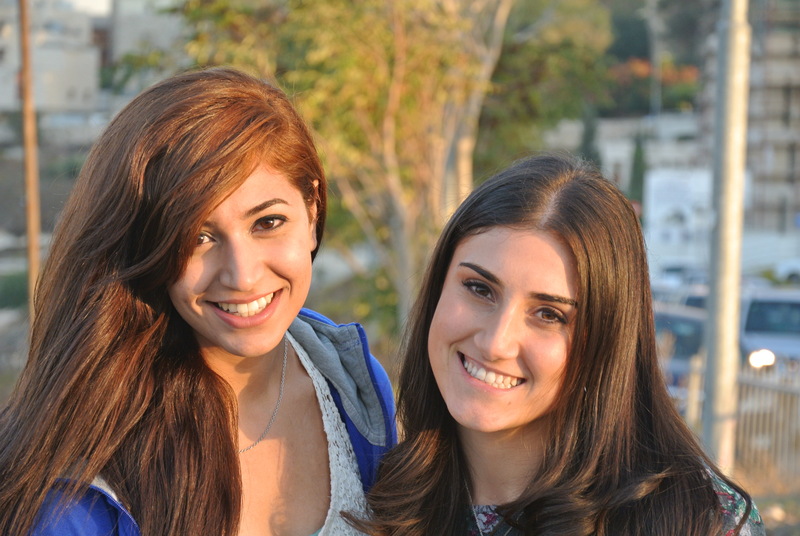 Along with her friend Rebecca Rosenblatt, who is studying Arabic at the university, they stood overlooking the police and residents mingling in the streets. Rosenblatt asked her friend why the police go into the neighborhood. “They want trouble,” Awad responded. And the youth in the neighborhood were obliging them. As evening came on, Awad said she couldn’t leave her house because of the ongoing street altercations, as the municipality and police try show they are in control of the area. This looks very familiar to me. Violence-torn American inner cities from the 1960s through the early 1990s exhibited many of the same properties: a small, violent minority victimizing mostly the locals, in the name of battling powerful outsiders; widespread resentment of the police, despite their importance to maintenance of local order; economic ruin, blamed mostly on the powerful outsiders rather than the violent rioters who are causing most of the damage; and an outsider elite openly sympathizing with the rioters, obstructing the forces of law and order, and thus encouraging continued mayhem, at the expense of the locals and everyone else (save the elite themselves, of course, who exploited their alliance with the troublemakers for social and even economic gain). In the US, at least, the ultimate solution was a strong crackdown on general lawlessness, which reminded everyone of the benefits of law and order, irrespective of any deep social fissures that may encourage sympathy with lawbreakers. I can only hope that Israelis’ patience eventually reaches the same limit that Americans’ patience reached in the early 1990s, with a similar positive result. I guess we will see, I doubt there will be much change for the better.